See Moss, Graham, Tsang, A Treasury of Chinese Snuff Bottles, Vol. 4, Inside-Painted, pp. 9-19 for a reassessment of the "Early School" of inside-painting. The authors suggest that the beginnings of inside-painted production took place in Beijing in the north, rather than Guangzhou (Canton) in the south, and that a group of inside-painted bottles with Manchu script are the earliest of the school. Inside-painting of snuff bottles was then developed by Yiru Jushi and a school of followers, and then spread to the south where the Lingnan School in Guangdong was established by Gan Xuanwen and a circle of friends, including Chen Quan. Lingnan was an early name for the general area of Guangdong province. The earliest inside-painted work by Gan is dated to the fourth month of 1815, see M. Hughes, The Blair Bequest. 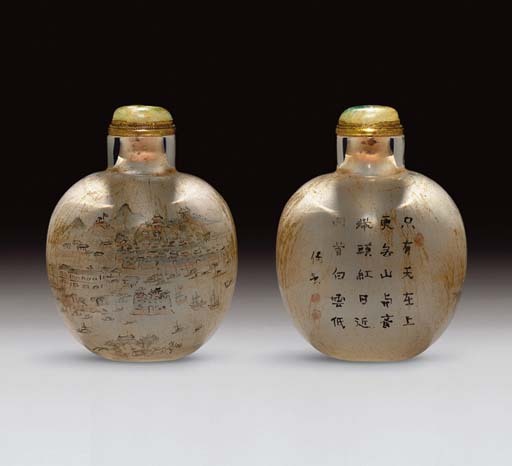 Chinese Snuff Bottles from the Princeton University Art Museum, p. 238, no. 333, and the latest-recorded of his works is from 1823. There are in addition a number of bottles by Gan, or attributed to him, which are undated. Gan Xuanwen was a literatus and painter who took up the art of painting inside snuff bottles, and his style is, quite understandably, taken from the literati tradition of painting. His status as a scholar-painter might have been largely forgotten if not for his snuff bottles and a single surviving handscroll in the collection of the Chinese University of Hong Kong. See H. Moss, "The Lingnan School of Snuff Bottle Interior Painters - Part I", JICSBS, Spring 1991, pp. 7-15, in which the author deduces from a damaged date on the inscription that it must have been painted between 1807 and 1814. The painting bears several colophones by other Lingnan scholars, including one by Chen Quan, and includes a signature that reads "Gan Xuanwen of Gugang in Lingnan". The bottle is inscribed with the poem Yong Huashan ("Ode to Huashan") by Northern Song poet and prime minister Kou Zhun, who allegedly, at age seven, was so moved by the sight of the mountainous landscape at Huashan that he composed the poem on the spot. And white clouds float below as I look back." Most of the seals on Gan Xuanwen school bottles are illegible and were obviously meant as visual emphasis and a nod to the tradition of literati painting rather than to be read. The scene on this bottle is identical to one attributed to Gan's hand in the Bloch Collection (see Moss, Graham, Tsang, op. cit., no. 449), depicting either the Dutch or French Folly Forts which stand between Guangzhou and Whampoa Island on the Pearl River, close to Guangzhou. The European trading warehouses (hongs)are also shown. For other scenes of the port, see Emily Byrne Curtis, "Chinese Snuff Bottles in the China Trade", Arts of Asia, March-April, 1980, p. 91 and Marcus B. Huish, Chinese Snuff Bottles of Stone, Porcelain and Glass, p. 28, pl. 7.